The thing about weight is it goes on twice as fast as it comes back off. You wish for it to come down the hill as fast as it went up the hill. And the thing about impatient people -- we get really impatient trying to get the ball coming back down the hill. 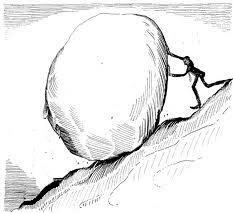 It's like Sisyphus, but in reverse. I have a plan. Not overly aggressive. Manageable. I have someone holding me accountable. I need one more person, I think, but we'll see. I had my body fat % tested -- it was a lot worse than I (or anyone I've told) would have estimated. I have a lot of work to do. It's a lot of fat to burn or a lot of muscle to build, or some combination thereof. I have a reward. A huge reward at the end. It's pretty awesome and I'll share it when I've made some progress. So, yeah, I'm back up -- most of all of what I lost last year -- and I'm going to start working my way back down. Through actual life changes and slow and steady progress - instead of trying to kill myself for instant (non-lasting) results. The Habit Course: Weighed & Charted myself.